If you are lucky enough to have an old-fashioned lilac, I hope you cut a few blooms for a bouquet in the house. 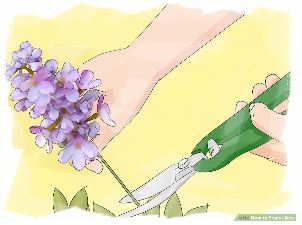 The first picture shows where to cut for a bouquet. Once the remaining blooms on the shrub fade and turn brown (May into early June), they should be removed right away. Lilacs set the buds for next year’s blooms very quickly after flowering. If you wait too long to prune, you will be removing next year’s blooms. 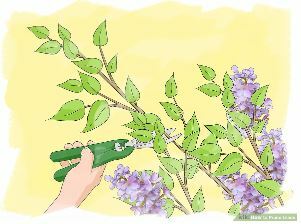 When removing spent flowers, also prune some of the branches to keep the shrub looking tidy and to thin it a little for better air circulation. The second picture shows pruning the branches back. You can remove up to 1/3 of the branches. Make your cuts above a leaf bud, as this is where the new growth will emerge. If there are branches showing damage or looking weak and unhealthy, cut these lower, even to the ground if necessary. Lilacs need plenty of sunshine. If they are too shaded, too wet, or have poor air circulation, Powdery Mildew can take hold. It starts as a whitish to grey coating (like they’ve been dusted with baby powder). Later, it can become black and the leaves may wilt. While this is unsightly, it does not usually kill the lilac. Good pruning techniques can improve the overall health of the shrub. Mother’s Day is May 14 th this year. Flowers are a sure way to make mom smile. Gather the kids and head to the local garden centers. The selection is best in May; just know how much sun the planting will have. There are annuals, roses and, flowering shrubs and trees to choose from. 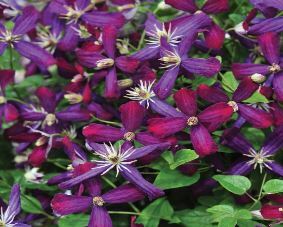 If you have a sunny spot, why not try a clematis? You’ll need a sturdy trellis for it to grow on. Colors range from white to pinks to reds and purples. One of the newer varieties is Sweet Summer Love. It is a vigorous grower with a profusion of fragrant cranberry colored blooms that fade to purple. This would be a good one for growing on a fence too. The frost-free date for our area is May 15 th . That’s when it is assumed to be safe for planting tomatoes, peppers, eggplant, zucchini and squash, among other vegetables. If we were to have a late frost forecasted, be sure to cover these tender vegetables overnight to protect them. Tomatoes need support to keep the plants from trailing over the ground. The obvious is to use a tomato cage but, you can also use sturdy metal fencing to form an enclosure. Just be sure to use a fencing that has at least 4” spaces to allow for easy harvest. To give added support, drive a single T-post or tall stake into the ground against the wire ring. 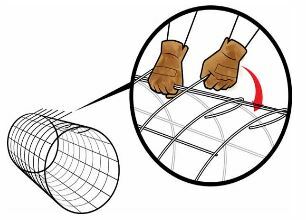 Simply use twist ties or zip-ties to attach the cage to the post. Tomato cages are also useful for supporting pepper plants, since they can become quite top heavy when loaded with peppers. Keeping the plants off the ground helps to keep the vegetables out of reach of most worms and small critters that will gladly eat your harvest.